Stock is trading at X. You short A and long B. Short A and buy B —each with the same weekly option expiration. Since option A has more value than option B because option A is closer to where the stock is trading at X — when we short A and buy B, we will generate a net credit received from this trade. If you receive $1 from shorting A and you pay out $.50 buying B, then your net credit for this double trade, but single transaction is $1.00 – $0.50 = $0.50 in net credit received. With a multiplier of 100 that is common for index ETFs such as SPY, that’s $50 per contract. You’re betting that the stock or index won’t go above a certain strike A. If it stays below that strike at expiration, then you collect the full credit. If it expires above your strike, then you begin to lose money quickly. By the time you reach strike B, you’ve reached your maximum loss. While the probability of losing is generally low (less than 30% depending on strike selection), when you do lose, the amount of loss is often greater than the amount of gain. From a strictly mathematical point of view, this strategy generally executes for good probabilities but limited upside potential. As an example, you might have a 67% chance of making $1 or a 33% of losing $2. From a risk-neutral perspective, you just break even—maybe you’re slightly positive. But that’s from a strictly mathematical point of view. Traditional options traders generally take this law of large numbers approach. They do hundreds and thousands of trades with the assumption that as long as they probabilities are slightly over 50%, then over time, they will make money. But we here at LifeStyleTrading101 don’t want to do hundreds or thousands of trades. Not only do commissions and bid-ask spreads eat up a lot of the money, but we also don’t want to sit in front of your computer screens or even mobile screens and make trades continuously like we have no other life. We work to live, not live to work. Plus we don’t want to deal with so many positions. We believe less is more. So instead, we combine this strategy with our wave theory analysis so that we can increase the probabilities that you see in that diagram. When the stock is trading at X, the probability at that strike is 50%. There’s a 50% chance the stock will be below it and 50% chance that it will be above it. But based on our wave analysis, we can evaluate that it’s actually not a 50/50 probability there. 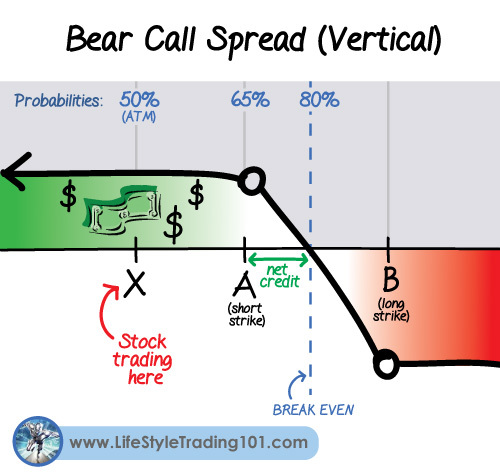 When we can time it such that there is a 75% chance the stock will be lower than where it is trading it, then we can choose a few strikes above that with a higher probability than what is shown on that diagram. So our goal is to identify what we believe are 80-90% probability strikes and then we short those. Then we buy strikes above that according to how much they cost and our level of confidence. You want the stock to be below strike A when the option expires. Max Profit = net credit received for selling call with strike A, minus the premium paid for the call with strike B.
Here’s a real life bear call spread on SPY options that we traded for $2,600 in gains. We shorted the 210 strike and bought the 212.5 strike. Expectation: S&P would either stay near where it’s at or go down a bit between now and expiration in 9 days. Based on our Elliott Wave Analysis, we did not expect it go down a lot between now and near-term weekly expiration — particular because it is Thanksgiving week and historically, not much usually happens during this week. What Actually Happened: S&P moved up a little bit, but not a lot. On the day of expiration, S&P dipped towards our Strike A — and we took that opportunity to exit the trade. It wasn’t the perfect max profit of $1,500 we were aiming for, but because of a risk of a bounce, we exited the trade for $1,200 –close to our goal of $1,500. 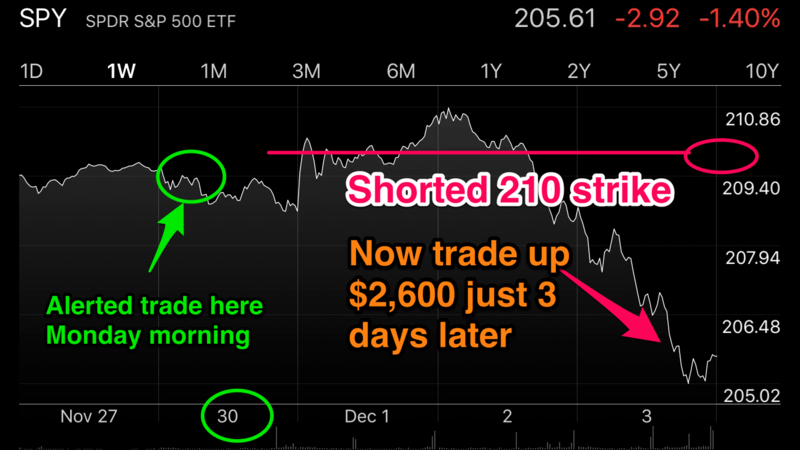 How To Short a Put Spread How To Close Out A Trade On Your Phone Out-Of-The-Money (OTM) Call Option Fed Announcement, Wednesday, December 16, 2015 – Which Count?